Other top U.S. officials have contacted the Saudi Crown Prince. More than a week after a prominent Saudi dissident and Washington Post columnist went missing, President Donald Trump has spoken to Saudi officials "at the highest level" to press them on his disappearance, he said Wednesday. Trump declined to comment on whether he would hold the Saudis responsible, saying, "I have to find out who did it." But he said the U.S. is demanding answers: "We're demanding everything, we want to see what's going on here." Critics have accused the White House of being slow to react to Jamal Khashoggi's disappearance and hesitant to criticize the Saudi government, a close partner of the Trump administration, amid reports that U.S. intelligence reportedly knew ahead of time of a plot to capture him. While the Trump administration's response has been muted -- said to be waiting for more details -- Congress has been expressing outrage for a week now, with Republicans and Democrats warning this could be a breaking point for the U.S.-Saudi relationship and triggering an investigation that could lead to sanctions on Saudi Arabia, an unprecedented move. A vocal critic of the kingdom's rulers, Khashoggi went missing last Tuesday after he visited the Saudi consulate in Istanbul, Turkey, for routine paperwork. Surveillance footage released by the Turkish government shows him entering the consulate, but they say there is no evidence he left afterward, leading Turkish officials to say they believe he was killed. 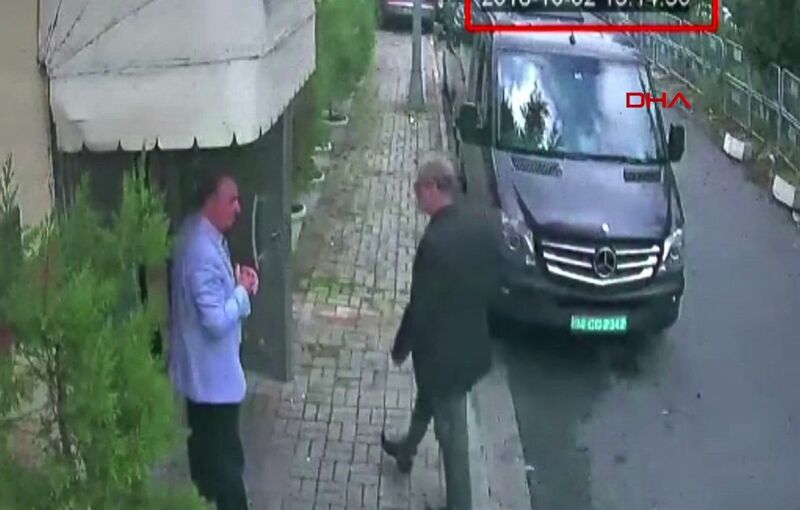 (AFP/Getty Images) This video grab made on Oct. 10, 2018, from CCTV footage obtained from Turkish news agency DHA, shows Saudi journalist Jamal Khashoggi, right, arriving at the Saudi Arabian consulate in Istanbul on Oct. 2, 2018. Khashoggi, a Washington Post contributor, vanished on Oct. 2, after entering the consulate to obtain official documents ahead of his marriage to his Turkish fiancee. The head of the Turkish-Arab Media Association alleges that Khashoggi was killed and dismembered, his body parts then being removed from the consulate. ABC News has not verified any of those startling claims. The Saudi government has fiercely denied any involvement in his disappearance, saying he left the compound and went missing afterward. In his first extensive remarks about Khashoggi's case, Trump took a tougher line on the Saudis, calling it "a very sad situation. It's a very bad situation. And we want to get to the bottom of it ... I'm not happy about this." "We cannot let this happen -- to reporters, to anybody," he added during an Oval Office meeting with the Secretary of Homeland Security and Federal Emergency Management Agency administrator. In addition to Trump's call, National Security Adviser John Bolton and Senior Adviser Jared Kushner spoke to Saudi Crown Prince Mohammed bin Salman, the real power behind his father King Salman, on Tuesday, with Secretary of State Mike Pompeo following up in a separate call "to reiterate the United States request for information," according to White House press secretary Sarah Sanders. All three officials pressed MBS, as the Crown Prince is known, for more details and urged his government to support a transparent investigation, Sanders added. Vice President Mike Pence said Wednesday the U.S. is "ready to assist in every way," but the State Department wouldn't say if an actual offer of assistance was made to the Turkish government as it investigates. In addition to the Saudis, State Department officials have also been in touch with Turkish authorities, but the agency's deputy spokesperson Robert Palladino wouldn't say whether Turkey has shared any of its findings with the U.S. -- declining to get ahead of their investigation, even as Turkish officials have leaked details of it to the press. That's because Turkey wants U.S. support before it accuses Saudi Arabia, an important trading partner, of a murder plot, according to analysts who spoke with ABC News, and the Turks are nervous that the U.S. will not come to their support because of its close ties to MBS. It has vouched for the Saudis on their bombing campaign in Yemen and refused to pick a side between Canada and Saudi Arabia in their diplomatic row over human rights. But to many on Capitol Hill, this could mark a turning point. Twenty-two senators, including every member of the Senate Foreign Relations Committee but two, signed a letter to Trump Wednesday that requires him to now conduct an investigation within 120 days to determine if someone violated Khashoggi's human rights and, if so, sanction anyone found responsible. Those violations include torture, prolonged detention without charges, abduction, or killing. "If Saudi Arabia took a U.S. resident, lured him into a consulate and killed him, it's time for the United States to rethink our military, political, and economic relationship with Saudi Arabia," said Sen. Chris Murphy, a Connecticut Democrat. Several Republicans agreed, even those who've had closer ties or warmer words for the Saudis and the young Crown Prince who many have painted as a reformer. 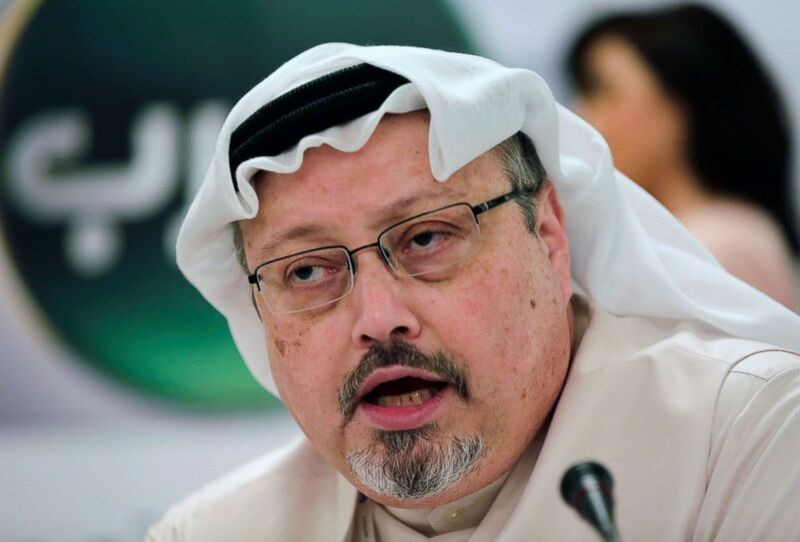 "If it plays out that the Saudi Arabian government has mistreated this man because of his dissident voice in Istanbul, it will be a game changer for me," Sen. Lindsey Graham, a South Carolina Republican, said, with Sen. Marco Rubio, R-Fla., telling reporters if the allegations are true, "It'll have a dramatic and negative impact on our bilateral relationship. Some called for the president to do more: "What we need now is for the president to get serious about questioning Saudi Arabia and letting them know what information is out there and asking them to explain. I've heard no good explanation so far," said Sen. Jeff Flake, R-Ariz. It's unclear what the U.S. knows about Khashoggi's disappearance, but Trump did cast some doubt on the reports that Khashoggi was murdered. "Nobody knows what happened yet. They don't know over there," he said, although it's unclear if he meant the Saudis did not know or if Turkish authorities who are investigating still do not know. But U.S. intelligence reportedly intercepted communications between Saudi officials discussing a plan to capture him, the Washington Post reported Wednesday. "Although I cannot comment on intelligence matters, I can say definitively the United States had no advance knowledge of Jamal Khashoggi’s disappearance," Palladino said in response during a department press briefing -- notably not commenting on any capture operation. Given the elaborate details of the reported plot, the U.S. must have known something, according to Ned Price, a former special assistant to President Obama on the National Security Council staff and someone who also worked at the CIA. "It seems rather implausible that no one knew something like this was coming, and the question then becomes what was done about it," he told ABC News. "Did they perform their duty to warn function, or was that duty to warn overridden in this case because of this administration's close and cozy relationship with the Saudis?" After Khashoggi's fiance wrote an op-ed in the Washington Post, pleading for Trump and his wife Melania's help, the president said that the first lady's office was working on inviting her to the White House. ABC News's Ben Siegel contributed to this report from Capitol Hill.